The charming exterior. What horrors await inside? We’reeee baaaack! 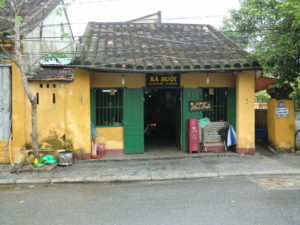 (Though only for some vietnamese special features, but still). 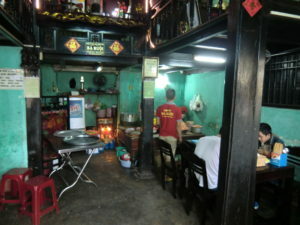 This time we visited a famous restaurant in Hoi An, who’ve apparently been around since the 50s. That’s older and more famous (except for Tim Ho Wan) than any shabbyplace we ever visited before, so we enter with somewhat mixed expectations. 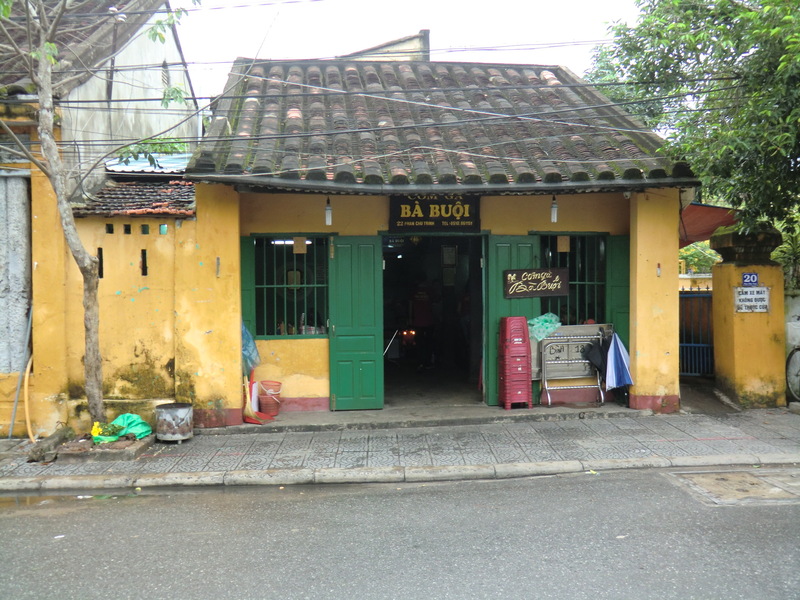 The facade, like all of Hoi An, is painted in a pleasant yellow hue and looks generally, generically pretty in a somewhat bucolic fashion. Can this really be what it’s purported to be, a shabbyplace? Yes it can! Asia always delivers. The cramped (‘cozy’) interior space sports some fancy hardwood pillars and terraces, but the grease-stained and bleached mint-green walls and hard concrete floor offsets any comforting feelings this might engender. Unless you’re like us, that is; now, we’re giddy with excitement. The color scheme and the peeling paint creates a vaguely Caribbean colonial atmosphere. 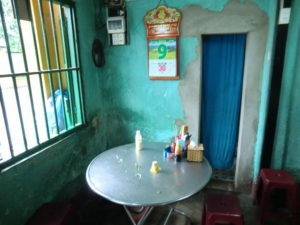 An open kitchen, cold metallic tables, plastic footstols, bleached photographs and random plastic sheets with floral patterns completes the wonderful picture, though a bonus mention goes to the mystery door with a blue plastic curtain, framed by walls where the paint have peeled of and exposed the grey concrete underneath. What horrors lurk behind? Could it be the only thing worse than an Asian shabbyplace; an Asian bathroom? We don’t dwell on this, however, but eagerly proceed to the food. Like in a hundred thousand times more fancy (but less cozy) places in Europe, there’s one single dish. In this case; Chicken rice. 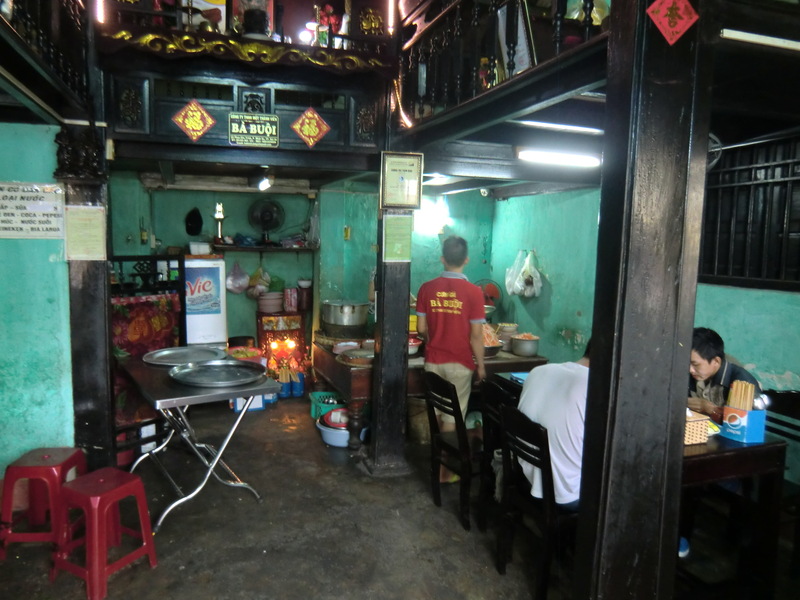 One should be able to assume they’ve mastered it by now, because we do have fond memories of similar shabbyplaces, surprisingly excellent, back in Kunming. Not taking anything for granted however, because Asia is the continent of randomness and weirdness, we take a bite. And two. And three. There’s tender, tasty chicken pieces on top of masterfully steamed rice, decorated with onion slices and a cornucopia of herbs, and accompanied by some bowls of a really, really amazing broth. 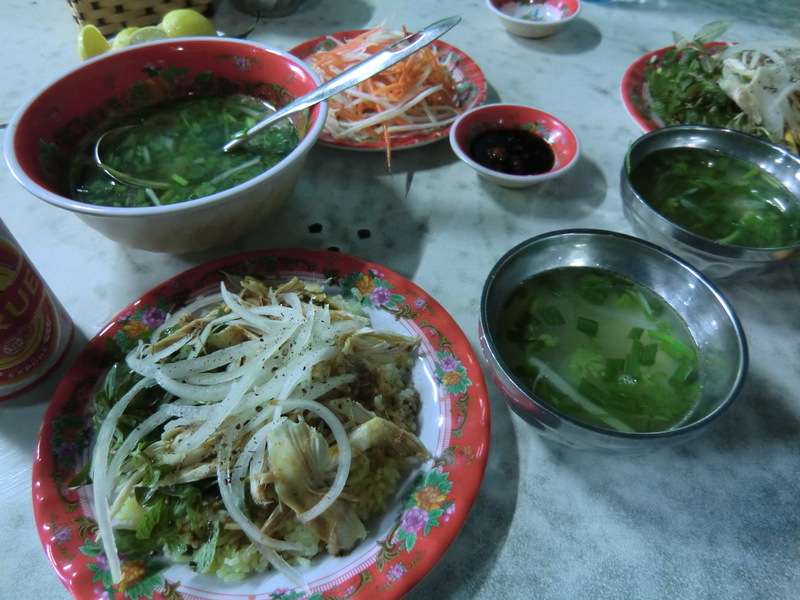 Like most good vietnamese food, there’s an odd feeling of freshness and crispness to it, despite it’s ramshackle surroundings. Though the portions could have been bigger, of course it’s dirt cheap, and we leave satisfied (and mystified that we haven’t gotten stomach sick yet). Once again we’ve proven our case! The best food is found in the shabbiest places, in China as well as in Vietnam.